Here comes a good news for those of you who are planning to purchase the HTC Flyer - the feds have given their approval for the Wi-Fi-only version of the tablet, which brings us one step closer to its actual release. As we told you, the HTC Flyer was available for pre-order on Best Buy, which priced the 16GB Wi-Fi version at $499. Its launch date is stated as the vague "this spring" by the online retailer. The HTC Flyer is set to arrive in Europe on May 9, while some reports claim T-Mobile is to launch this device at some point in the future. 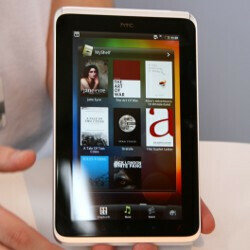 Sprint's WiMAX-enabled version of the tablet, named the HTC EVO View 4G, will be available in Q2 of this year. For more info on the tablet, check our HTC Flyer Hands-on. what difference is between HTC Flyer Wi-Fi & HTC Evo View 4G?! is there any difference except their names? !